Some of my work hanging at Shaw’s Creek Cafe. This is my second opportunity to hang my work at Shaw’s Creek Café . The Alton Mill Art Centre is located just north-west of the Village of Caledon, Ontario near the Millcroft Inn. The Mill is a beautiful stone building that has been refurbished to house a wonderful collection of Artist’s studios and galleries. The Centre is open year round, but during the weekend of January 21/22 there will be special entertainment, demonstrations and workshops in their annual event called Fire and Ice. 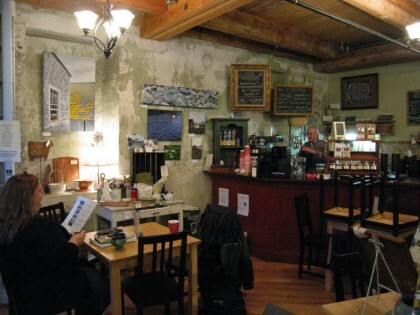 My work is at Shaw’s Creek Café, just inside the main entrance on the ground level. I highly recommend trying the date squares at the café! The work that I am showing was, for the most part, painted in the summer and fall of 2011. It represents some of my favourite places and things in Nova Scotia; the beautiful weathered buildings at Peggy’s Cove, the spectacular rock strewn beaches, and the ever changing water of St. Margaret’s Bay. My work will be at the Mill throughout February. I hope that you’ll be able to visit the Café and the variety of studios throughout. It’s a wonderful drive through the Caledon Hills, about an hour from downtown Toronto.